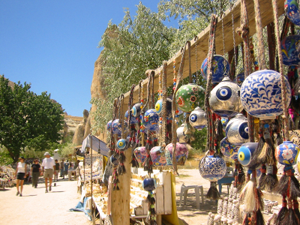 Antalya has many shopping centers with world wide famous brands. For tourists, some of the best shopping stores for jewellery, carpets and leather goods may be found in the Kaleici district (also known as the old city ) near the city walls. Also Cumhuriyet, Güllük, Atatürk and Işıklar are the main shopping avenues. There are also traditional, bazaar type, colourful, fresh produce vegetable and fruit markets.